An illuminator of uncertain origin, who decorated a manuscript of the works of Julius Caesar and is therefore known to art historians as the 'Caesar Master', was the artist of this Book of Hours. Several manuscripts decorated by the artist have been identified: they allow us to deduce that he worked in the middle decades of the 15th century, for clients associated mainly with London and Oxford. An inscription suggests that by 1475 this manuscript was owned by John Alburgh (probably from Alburgh, between Harleston in Norfolk, and Bungay in Suffolk) or one of his close friends or relations. The Caesar Master's style is not typical of English manuscript illumination, and it has been suggested that he was a foreigner who came to work in England. 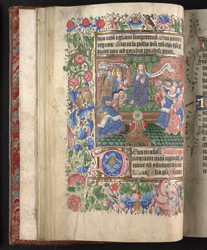 The subject of the present miniature is very uncommon in English Books of Hours, but common in Dutch ones, suggesting that he may possibly have come into contact with Dutch books or book-makers during his early years.